A new way to serve your favorite elite drinks! 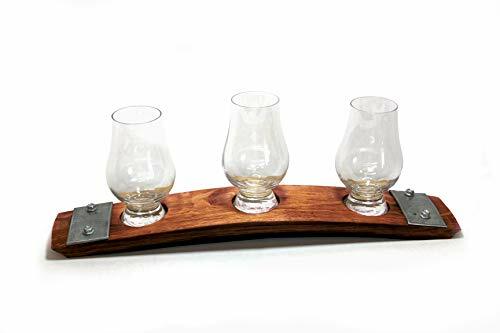 This Premium Whisky flight is our newest inventory edition, features two metal barrel ring plates on each side and premium Glencairn Crystal glasses. Handcrafted from imported French wine barrel and each flight is unique. 3 Glencairn Crystal glasses are included. Free Shipping! Colors Available: Dark Walnut, Red Mahogany, Natural. We are happy to take custom orders! If you have any questions about this product by Barrel-Art, contact us by completing and submitting the form below. If you are looking for a specif part number, please include it with your message.